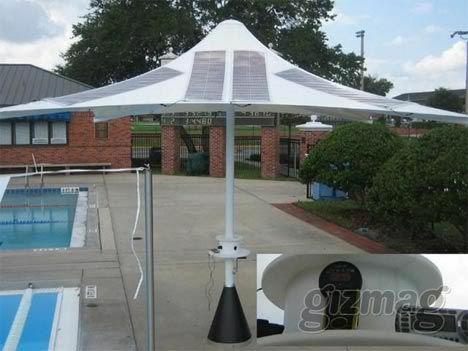 Treehugger posted about this awesome umbrella that will be available next month. Not only is it solar powered, but it's also 100% recyclable and waterproof. I'm not sure how many outlets it has, but after a day in the sun, it should have enough power to charge ipods or a laptop battery. I'm sure it will be expensive and yeah, it's kind of eye roll-worthy, but I think it's a unique idea and definitely something I'd love to have. Yes, we should all get out in the sun and leave our electronics behind, but this is great for those times where I have things to do online and would now have the opportunity to take my work outside in the great weather. I love taking my laptop outside anyway, but a battery only lasts so long and unless the shade is just perfect, there's usually a glare on my screen. Yuck. I'll be interested to see how many public areas end up putting these into place. I can see them being a hit at hotels, especially with all those people on business trips or all the family outings that may bring along their iPods/stereos/etc.